The YWCA in Wheeling was organized in 1906. In an April 9 meeting of that year, a constitution was adopted and 30 women were elected to the Board of Directors. A house at 1207 Chapline Street was rented in January of 1907 and was opened to the public in June of that year. 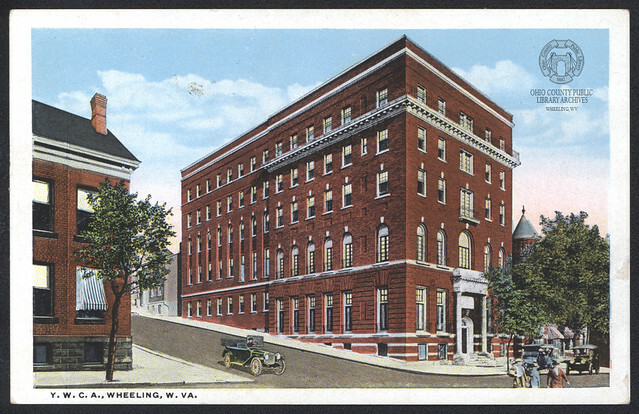 In the Spring of 1908, the YWCA moved to the Schenk Building at 1130 Market Street. Construction began on a new building, designed by Wheeling architect Edward Bates Franzheim, in 1913. The new building, located at the corner of 11th and Chapline Streets, opened in December of 1915. In 1921, The Blue Triangle Branch — a segregated branch of the YWCA for young African-American woman — was formed. The Blue Triangle Branch existed until June of 1956, at which point the YWCA became fully integrated. ▶ Potpourri article: Old Days of the YWCA in Wheeling, by Blanche Steenrod, News-Register, 1938. ▶ Vertical File: YWCA: Young Women's Christian Association, Wheeling Room, non-circulating, ask for access at the reference desk. ▶ Vertical File: YWCA Building, Wheeling Room, non-circulating, ask for access at the reference desk. ▶ Special Collection: YWCA Collection, 1910s-2000s. Unprocessed Archival Collection, non-circulating, must make an appointment to view materials. ▶ Special Collection: Zou Hastings Frazier Memorial of the Young Women's Christian Association., Archival Collection, non-circulating, must make an appointment to view materials.